Alcatel-Lucent Enterprise's open platform approach, specifically third-party PBX integration, has us paying attention. Wainhouse Research has been working closely with the Alcatel-Lucent Enterprise (ALE) product team over the last six months, and has gained a deep understanding of its Rainbow platform strategy. This is an update on the experience Rainbow currently provides, ALE's strategy, and our analysis of the company's direction. In December 2016, ALE launched Rainbow, officially joining the team messaging party. In doing so, ALE bellied up to a bar crowded with hipsters from the likes of Unify (Circuit), Cisco (Spark), Fuze (Spaces), RingCentral (Glip), Mitel (MiTeam), BroadSoft (Team-One), and Slack (Slack). Elbow room has gotten even tighter since then, with Avaya (Zang Spaces), Microsoft (Teams), and a growing number of other well-known vendors nudging in. Rainbow launched with a basic set of group-messaging features and as a freemium-only offer. 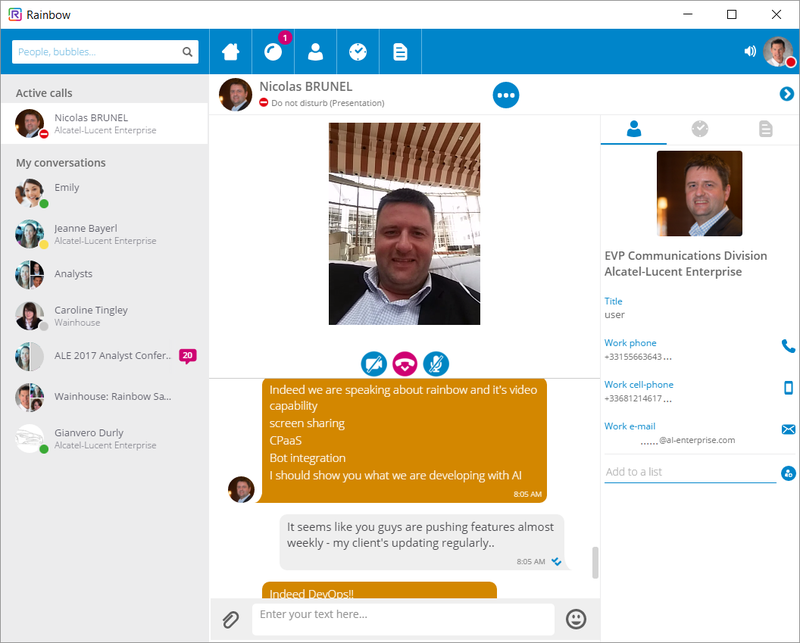 Fast-forward six months, and Rainbow now supports chat, presence, file sharing, and audio and video calling -- all available on PCs and mobile devices. More importantly, Rainbow now integrates with ALE and third-party PBXs via the Rainbow Connector -- effectively telephony-enabling the client. We expect to see additional features and integrations crop up regularly, including screen sharing, native telephony, and integration with strategic conferencing service partners, further expanding Rainbow's value prop. ALE is also quick to point to Rainbow's CPaaS capabilities, which expand Rainbow's APIs to support additional integration with enterprise services and workflows. ALE's vision is to deliver vertical and enterprise-specific value through tight integration into Rainbow's service stack -- with as little friction as possible. "Open" is a key word in this strategy, and ALE's willingness to integrate to third-party PBXs indicates it is doing more than throwing buzzwords around. If you want to achieve UC's full potential, you need to deploy a consistent experience across the enterprise. You need to ensure adoption! How useful do you expect your communications- enabled business process to be when it only supports some subset of your users? For the average enterprise, sporting PBXs from multiple vendors, several UC-capable platforms, and a growing number of team messaging and other collaboration apps, dismal adoption rates should be no surprise. When asked, our IT decision-maker panels point to three common barriers standing in the way of expanding UC deployments: internal politics, lack of a compelling business case, and network concerns/costs. The fact is, coming up with a secure, timely, and cost-effective UC migration plan is difficult, if not impossible, for the average enterprise. And if you are planning to deliver a unified experience by migrating your users from their existing messaging, conferencing, and telephony experiences and onto a new UC platform, you should make sure you have a good book. Or three -- this is going to take some time (maybe consider the whole Game of Thrones series). Consumerization -- first, ALE is an established enterprise brand. The Rainbow service reflects this with its enterprise directory and calendar integration, security models, and the standards it supports for telephony integration. When you talk to ALE about Rainbow, you are quickly reminded of its "enterprise DNA": SMEs point to four-layer security, across the OS, transport, application, and user layers; they highlight borderless, B2B communications and the mobile worker; and they focus on customer segmentation, data sovereignty, and audits conducted by independent security firms. All enterprise, all the time. App Proliferation -- Rainbow provides the opportunity to consolidate your various communications apps into a single and supported user experience. Deployed as an overlay service, this is not "another messaging app" for IT to evaluate, deploy, and support -- rather, it represents a consolidated and unified user experience. Consolidated and unified equals fewer apps, not more. Platform Politics -- the ability to integrate with third-party PBXs and conferencing services is ALE's Trojan horse. Do this right, and you knock down politics, ROI, and network concerns in one fell swoop. The enterprise can leave its existing platforms in place -- at least the parts that tend to require the heaviest lifting -- while enabling the user experience within Rainbow, at the speed of integration. Then, IT can consolidate the platform layer at a pace that makes sense for it -- likely based on depreciation, break-fix, and end-of-life schedules. Meanwhile, users are taking advantage of Rainbow to message team members and partners, make calls, and start conferences from their desktops, mobile devices, or desk phones (this latter if they are over 40). To be clear, Rainbow is still maturing, and several critical enterprise features are yet to come -- specifically, native screen sharing, conferencing service integration, and native telephony. And ALE is not alone in this conversation. As noted, the team messaging bar is crowded with many well-known competitors. However, ALE is in a select group of vendors working aggressively on the overlay model, delivering a unified user experience powered by a range of integrated solutions. While platform migration is often an expensive headache, users have proven how quickly the application layer can move. And the vendors that win at the user level are well positioned to consolidate back-end services over time.